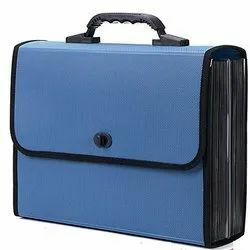 Owing to the sound industry experience, we have been successful in catering to the requirements of our esteemed clients by offering quality 5 Pocket Opaque Expanding File. We offer colorful range of files with in order to meet the requirements of clients. Our offered files are ideal for storing documents and other important agreements. - Waterproof polypropylene (PP) outer body with 13 pockets to store your documents. - Full expandable accordion file folder. Label card insert window on the front. - Includes blank color tab inserts. Elegant handle and buckle lock closure. Color: Red, Blue, Black etc. We are offering Expanding File Folder to our clients. Each Pocket Expand Upto: 1/2"
18% GST will be applicable on prices.